I really must take a moment to share an amazing blog with you. Dexter’s Super Savvy Mommy is written by another young (at least I like to think of us people around 25-years-old as young!) mama. She has an adorable little boy named Dexter who is oh-so-often involved in the topic of her posts as well as the object of her photography. Her blog focuses on product reviews, but the best news is that the products that she’s been reviewing for almost a month are all part of daily giveaways! That’s right, there are new contests every day which you can enter that she will be drawing for on May 10th, 2008. Support her by checking out her blog and hopefully you’ll walk away with something exciting, too! 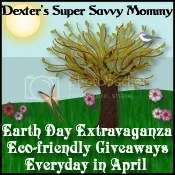 Please post on this blog letting me know that you visited Dexter’s Super Savvy Mommy.